Today’s ride was the “Glendale Vistas” route. We haven’t done this one since June, so it was time. 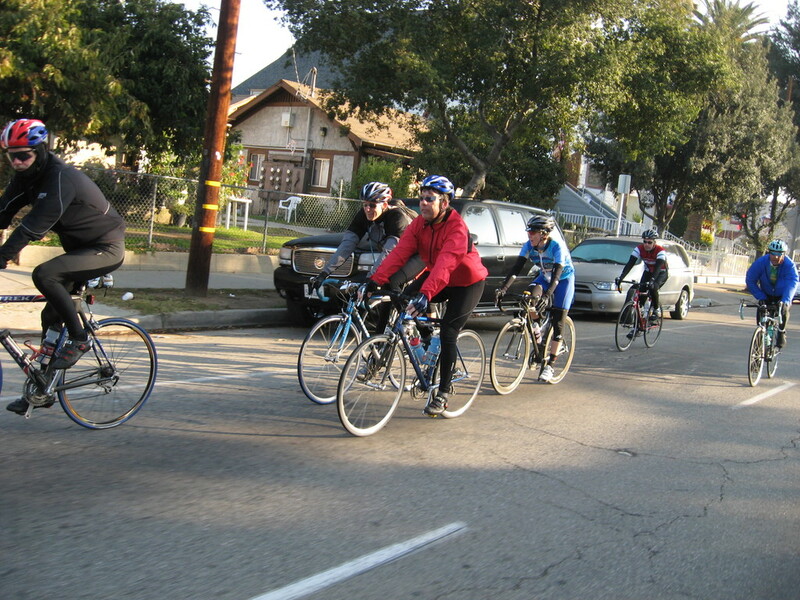 It was chilly this morning, but we had a good group of ten riders. Michael came out for the first time in months, which meant that there was going to be competition to be first to the top of the hills. And Vikki is visiting from Canada this week, so she came to ride with us, too. We rode out of Pasadena to La Cañada. 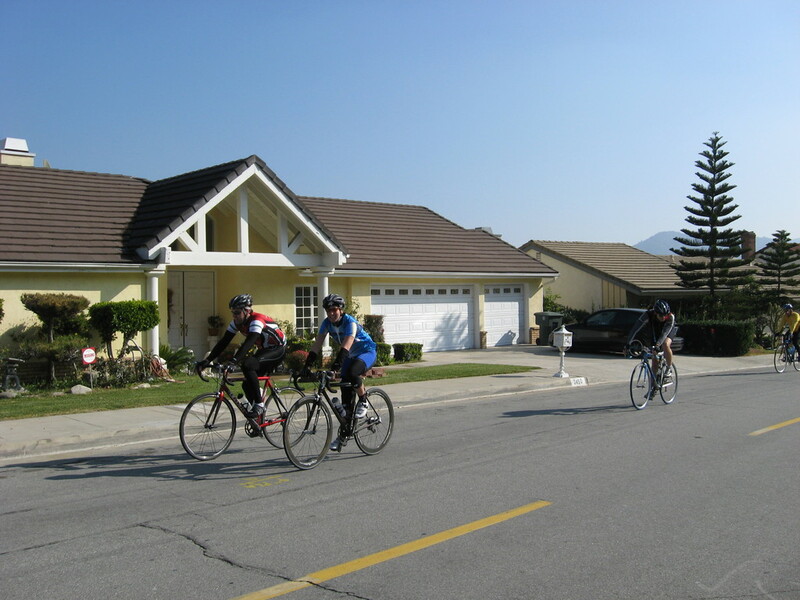 Then we turned up Chevy Chase for the first hill of the ride. The hill up the north side of Chevy Chase is long and winding, with a steep pitch at the end. 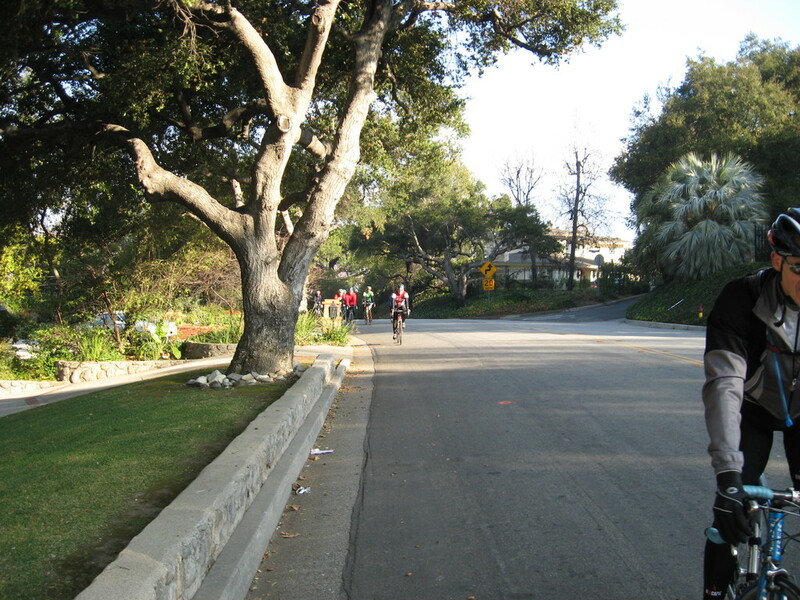 Then a nice long downhill into Glendale. At the bottom, we made a loop through Glendale, ending up on Glenoaks, where we stopped at Paradise Bakery. I had my usual two chocolate eclairs, since theirs are the best. And I wasn’t even worried about eating them before the steep hills in the second half of the ride. Leaving the bakery, we rode back across Glendale and started up into the hills. The first big hill started out on Royal Blvd, which wasn’t too steep. Then we turned on Old Phillips Rd, which was close to flat. Finally, we took a right on Kidonan Dr, which is the steep pitch to the top. And that was where Things Went Wrong. I was riding up the hill in my usual 39×17 gear, and I was pushing pretty hard to try and stay ahead of Michael. Then my chain skipped. I head the sound of pieces of metal falling on the ground, and the cranks spun free. I managed to get my foot out before falling over, and I looked down to see that the 17-tooth cog on my cassette had self-destructed. It broke into three or four pieces, and the chain was just wedged down into the space where the cog had been. I’ve been riding seriously since 1973, and this is the first time I’ve ever seen something like this break. Needless to say, this was a problem. First, we took the obligatory picture, and I stuffed a couple of the pieces into my bag for a souvenir. Then I walked up to the next flat spot. I was able to get the chain onto the next larger cog. 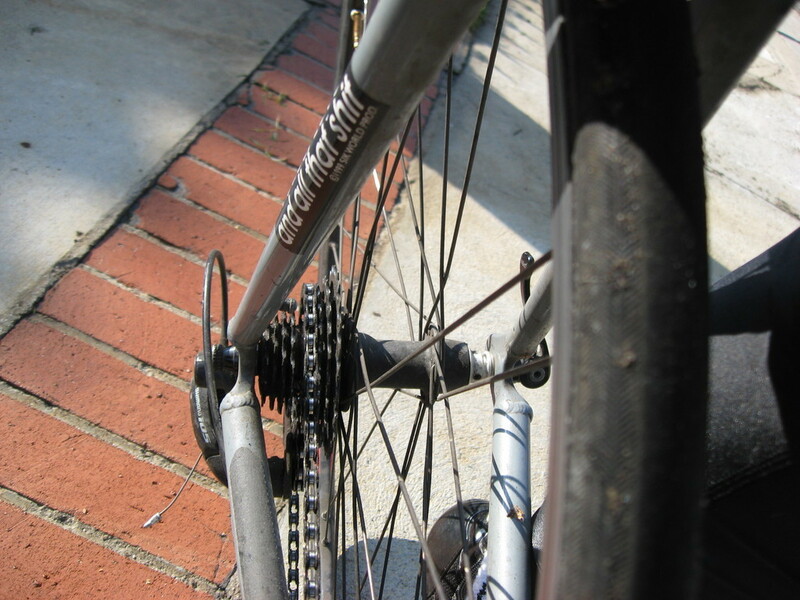 The picture shows the chain on the 9 speed 8 speed cassette. Then I rode very carefully the rest of the way to the top. The other cogs didn’t seem to be going too far out of alignment, so the bike was rideable, but shifting was probably not a good idea. Fortunately, we were getting close to the end of the ride, so just continued on. We rode down into Montrose and then up Hospital Hill. Then straight down and back into Pasadena and back to the park. It was a fun ride, even with the broken cog. Things like that are rare enough that the inconvenience was worth it just to have the story to tell. And it was nice to see Vikki again. 41 miles and one broken 17-tooth cog.